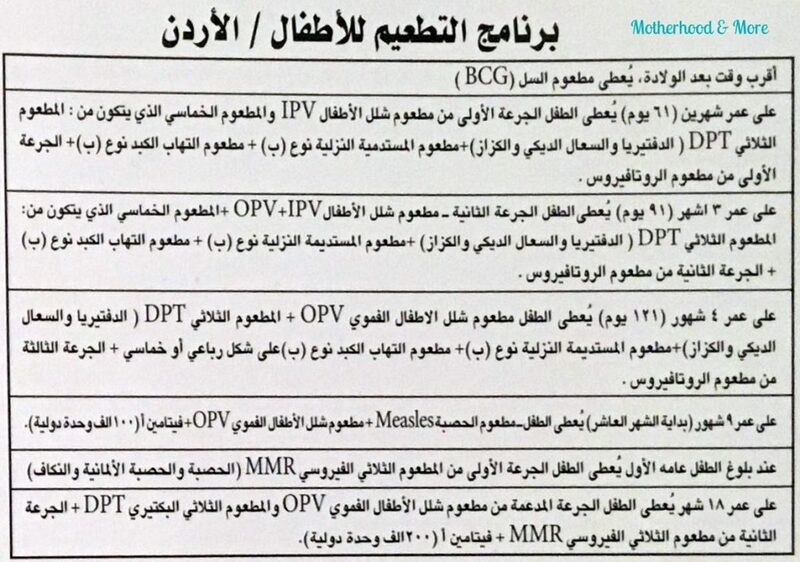 What is the National Vaccination Program in Jordan? Jordan is considered one of the first countries in the MENA region that started with the vaccination program. The program was established in June 1979 and was keen since then to keep up with scientific developments in this area and the introduction of new vaccines for babies and school children and pregnant women to prevent them from deadly diseases. Children’s mortality rate has fallen for kids less than 5 years in Jordan from 60 deaths in 1980 per 1000 births to 22 in 2010. 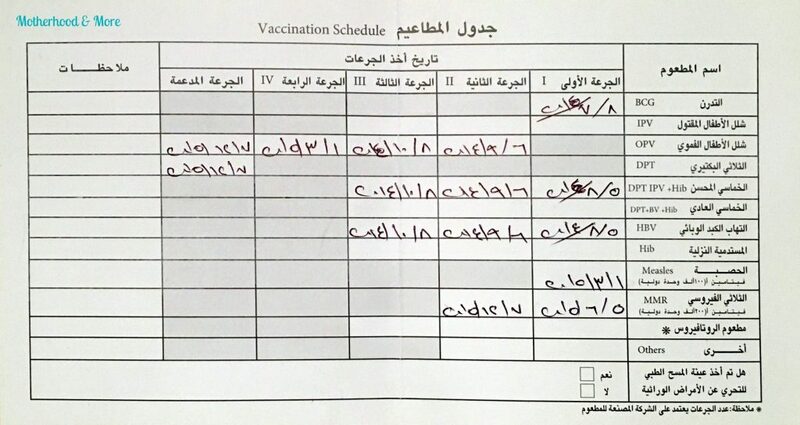 What is the schedule used in National Vaccination Program in Jordan? Your child starts with the vaccination schedule within the first month after his birth. The first vaccine is the BCG which prevents your child from “Tuberculosis”, this vaccine should be given within the first month after the child’s birth. The second vaccine, which is IPV1, diphtheria-pertussis-tetanus (DaPT1), HBV1, HiB1, Rotarix1 vaccine that can prevent from these diseases Poliomyelitis, Diphtheria & Pertussis & Tetanus, Hepatitis B, Haemophilus Influenza B, and Rota virus disease respectively. This one is given after the age of two months(61 days). At the age of 3 months (91 days), the third vaccine is given as the following: IPV2+OPV, diphtheria-pertussis-tetanus (DaPT2), HBV2, HiB2, Rotarix2 vaccines that can prevent these diseases Poliomyelitis, Diphtheria & Pertussis & Tetanus, Hepatitis B, Haemophilus Influenza B, and Rota virus disease respectively. At the age of 4 months (121 days), the fourth vaccine is given as the following: OPV, diphtheria-pertussis-tetanus (DaPT3), HBV3, HiB3, Rotarix3 vaccines that can prevent these diseases Poliomyelitis, Diphtheria & Pertussis & Tetanus, Hepatitis B, Haemophilus Influenza B, and Rota virus disease respectively. After 5 months, on the beginning of the tenth month, the fifth vaccine is given and contains OPV and Measles which prevents from Poliomyelitis and Measles diseases. When the child completes his first year, he takes the MMR vaccine which prevents from Measles -Mumps -Rubella. At the age of 18 months, the child takes the OPV(booster1), diphtheria-pertussis-tetanus (DPTbooster1), MMR2. All the above vaccinations are given for free at the Jordanian Health Centers that have Maternity and Child care department. Why follow National Vaccination Program in Jordan? It is for free! So, you don’t have to pay a fortune each time you get your child to take vaccines. Jordanian Health Centers have standards to keep the vaccines within their expiry date, so they are always fresh and stored in needed conditions, unlike other entities. You can find their storage conditions in the sources below. Jordanian Health Centers have schedules for each age group. So, you don’t have to wait a alot like regurlar doctor appointments as it’s all origanized. It never took me more than 15 minutes. Of course, if you like to take any extra vaccines which are not in the program, you can take them with you Pediatric. School children who were completely vaccinated will be given OPV+Td and checked for MMR (2 doses) in the first class, in the tenth class will be given Td and checked for MMR (2 doses).